About Kosher Market | Hollywood FL | Kosher Store. A growing Jewish & Israeli Supermarket Located in Hollywood FL. Our Local Kosher market, Provide delivery Services in Hollywood and The Broward County Area. We Have About Anything That You Need. Our Expended Kosher Supermarket, Welcome All From Broward county, Miami Area & West Palm. New Section of Kosher Food, Israeli Products, Fresh Meat, Roasting, and Home made kosher food. Fresh Meat, Fish, Kosher Hamburgers. we Also have a Butcher Onsite. If You Searching for A local kosher market store in the Hollywood Florida area, Need Kosher Catering Services, Hot Meals, Israeli Products, Or isreali Food, Levinsky Kosher Market got you Covered. We Still A growing Kosher market and we do Everything To Make Our Customer Happy, also Making sure To deliver All The kosher Food that You Need to Find in The Broward county & Miami Area. 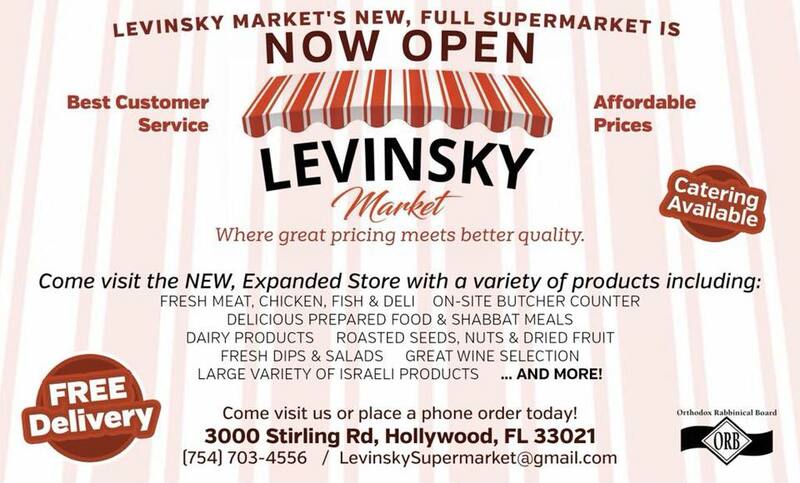 Levinsky Kosher Market, Also Providing Kosher catering and Delivery Services in The Miami & Broward County Area.